Full range of uniforms for Beavers, Cubs, Scouts and Explorer Scouts in stock, adult uniforms to order. Badges for section leaders are available along with many special items. 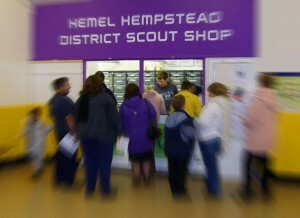 Hemel Hempstead District Scout Shop is open every Tuesday during term time from 7.00pm – 8.30pm. The shop is located at Hobbs Hill Wood Primary School, Peascroft Road, HP3 8ER. The leaflet contains the opening times, location, direction and dates we’re open. Any item from the national catalogue can be ordered and available usually within 2 weeks. To place an order or to send an enquiry – email shop@hemel-scouts.co.uk. Please state your name, Group (if any) and telephone number with your order/enquiry. What happens to the profit from the shop? Profits from items purchased from the District Shop go to support Scouting in Hemel Hempstead – currently the shop provides enough income to reduce the annual membership subscription payment by £3 per member. Ever needed to know exactly where all of your Scouting Badges are positioned?